In early autumn I started a new project at a little wood close to where I live. My first step was to contact the landowner and then explore the location to see if it had potential. The main considerations being, possible subjects, light, and backgrounds. On my first visit I was pleased to see lots of wildlife and found a clearing that would be well lit throughout the day. I started by making some squirrel proof feeders and set these up close to a dense hedge that bordered the woodland. The hedge had a little hollow in it and this was sculpted into a snug natural hide. The most important function of a hide is to disguise the human form, with shelter and comfort being secondary needs. Over the following weeks I visited the site regularly to maintain the feeders and spent some time observing the activity from a distance. The action was hectic with all the usual suspects coming in, but no sign of the Nuthatches and woodpeckers that were my target species. I knew these birds were about as I had seen and heard them so assumed they were still finding natural food. A few days later I decided to try an evening session, mostly out of curiosity, as I wanted to see what would turn up. The light was good and the autumnal leaves on trees beyond the feeding area created a very pleasant background. 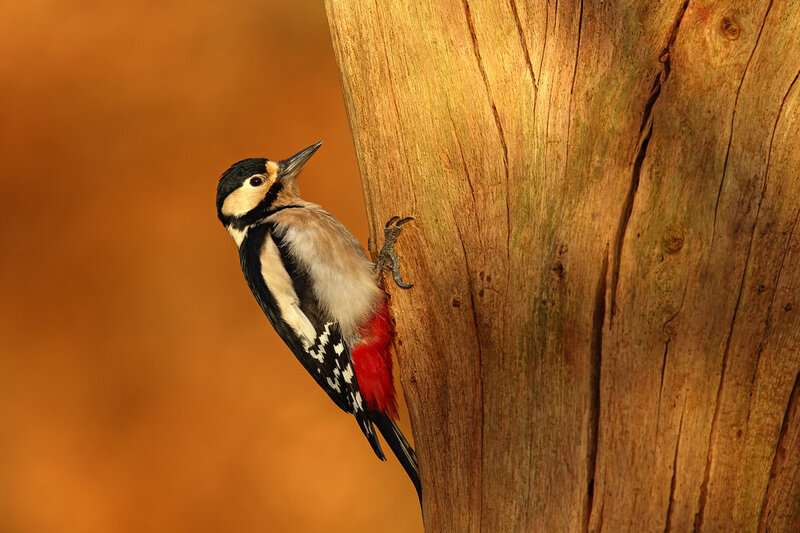 I was barely in the hide when a gang of smaller birds descended on the feeders and soon I heard the distinctive ‘kek’ of a woodpecker. I like to be prepared so invested some time making natural perches from wind fallen trees. I will either excavate an existing hole, or drill a new one to hide some food. If this is done correctly the hole will be barely visible in the final image. I kept the feeders topped up but there was still no sign of my favourite bird, the Nuthatch, which I had never photographed locally. This is where persistence is required and mine was rewarded a week later when a very handsome Nutty appeared in my viewfinder; it’s amazing how quickly they find the hidden food. The hide faces north into the woods and this allowed me to make the most of the low winter sun; especially at the beginning and end of the day. I like to start projects with ideas for images I want to make but try to be open to new opportunities as they arise. The Nuthatch became more accustomed to my presence and I was able to leave the hide and shoot back towards the light. I wanted to create an abstract picture capturing the shape of the bird in classic pose and this was achieved by heavily underexposing the scene to leave just a trace of rim light. One of the main goals for this project was to improve on my winter portfolio and the colder weather gave me some nice encounters with a variety of subjects including a stunning male Bullfinch. The shot below was another I had pre-visualised and on this occasion I used two stops of positive exposure compensation to create a high key scene. I have now started to fade out the feeding at this site as the weather warms and the birds natural food becomes easier to find. My simple hide has been very effective and I hope it will give me more opportunities next autumn. I am very fortunate to live just an hour away from the Yorkshire Dales National Park which is at its beautiful best in late summer when the heather is in full bloom. This wild habitat supports a wide variety of flora and fauna but perhaps the most iconic is the red grouse. I have visited these upland moors each summer for several years now hoping to capture the grouse amongst the flowering heather. I had built up a nice portfolio of images but felt some shots were missing or could be improved upon. As with most of my subjects, I see the grouse as a long term project and believe the more time you put in the better the results in the end. I also like to get to a location for sunrise as this often produces the best light, especially on sunny days. The red grouse is endemic to the British Isles and is herbivorous feeding mainly on the shoots, seeds and flowers of heather. It is considered a game bird and many are killed during the shooting season which traditionally starts on August 12. Unfortunately this coincides with the heather bloom which peaks towards the end of August and this can be restrictive if you go on the wrong day. The shot below shows the male bird with the bright red comb over his eye. Due to unsettled weather and other commitments I was only able to visit once this summer and wanted to make some photographs of grouse in the wonderful pink heather that had carpeted the landscape. These birds can be quite approachable especially when shooting from your car, the image below was captured in this way, using a beanbag to support my gear. I prefer to get down in the heather with the grouse as you can create pictures with a more intimate feel and better subject isolation as the foreground and background are thrown out of focus. The lower you get the softer and dreamier the image becomes and this can look nice with a more dynamic composition. The Kingfisher is a most striking bird and one of the nicest subjects to photograph. It had been high on my wishlist for some time, but a lack of opportunity resulted in only a handful of images and a distinct gap in my portfolio. I knew of a local hide with a good reputation and several of my clients had also recommended it. I usually like to work my own subjects but temptation got the better of me so I booked a day in mid-spring. My next move was to plan some shots in advance. To do this I research existing images, looking for what works and seeing if there are any spaces in the market. For me, this is an important and enjoyable step that can be the difference between good and great pictures. I really like making images that connect us to the creatures we live beside. 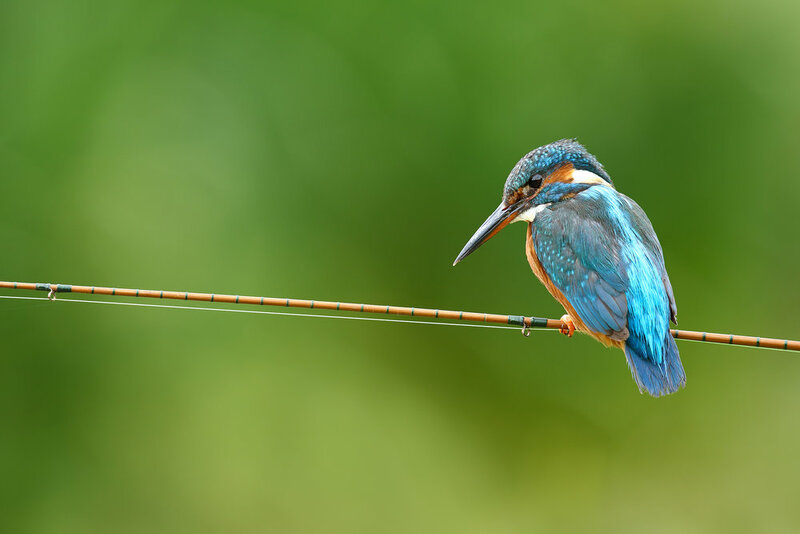 A classic example of this is a Kingfisher perched on a fishing rod or no fishing sign. Although these shots have been done before, I like the challenge of trying to do them better. The image below is the result of several hours preparation and almost a full day in the hide. I built the sign myself using scrap wood and then made a stencil to create the text; I even brushed some tea over the white paint to give it a weathered look. I had many visits before it all came together, the Kingfisher facing into the scene and everything on the same focal plane. One of my favourite recent projects has been working with the Roe deer at a local woodland. It all started on a fine spring morning, a few years ago, while I was photographing bluebells in a clearing between the trees. Something caught my eye and a beautiful female deer moved silently into the carpet of flowers; she paused briefly and then faded away. I remember it as a lucky encounter rather than a missed opportunity, but I had witnessed a special moment, and trying to capture it became a bit of an obsession. The best projects are the ones where you have a specific image in mind and must work to achieve it. I had two fruitless springs with only rare and distant sightings of the deer and nothing to show for my early starts and long days. The bluebells only display for a few weeks from late April into May, when the bracken pushes through and takes the light. I visited whenever I could and walked many miles tracking the deer and their preferred routes through the dense woodland. My efforts weren’t totally in vain as I now had a better understanding of my subject and its habitat. It was early May, in the third year, when I finally got my chance. Arriving before sunrise in full camouflage and waiting for hours with only the midges and mosquitoes as company. 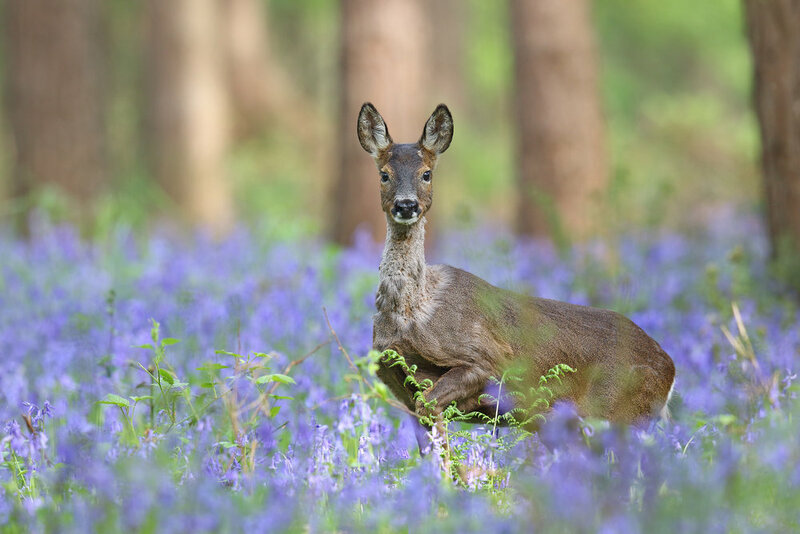 I hear two deer barking and then a young doe emerges from the distant trees and slowly walks into the bluebells, I line a single focal point between her eyes and fire one shot, then she is gone. I return to the woods each April with new hopes and ideas. As my knowledge of the deer improves, so do the opportunities. I have longer, more intimate encounters which have produced some very special images.